When my doctor shared the news I was stunned. After 25 years of having an auto-immune disease this was the last thing I wanted to hear. My hopes had been high that my stable situation would stay that way. Of course, in life, there are no flat roads for long. We always face challenges. Everything about what my doctor shared shook me to my core. My thoughts went straight to the implications for my kids. If my prescription medicine could cause me to get MS, leukemia, or liver failure, what were the other products we used in our house going to do to us? These things we think are safe, were suddenly making me wonder. My doctor told me that every year I have to be tested for the long term side effects of my “miracle drug.” That is now a fact of my life. After years of fighting to get healthy and feel well, I was facing even more health hurdles. The good news is, I have options and so do you. Immediately I started looking in our cupboards and medicine cabinets to search out the products we used for health support. Then, I started researching natural alternatives. I will always take my kids to the doctor when they are in need of medical attention, but since making some changes in our health and wellness routine, we have only needed to attend their annual well visits! I had counter top wipes that said I needed to clean my counters after using them before prepping food. Why would I use a wipe that left a residue that needed to be cleaned off after? Why would I use cleaning products that could harm my kids? I had been doing this for years, just trusting that it all was safe, yet the labels told me otherwise. Many questions started swirling though my head. I was afraid of being perceived as a “crunchy mom.” I used to fight against the stats and natural health buzz. I didn’t want to believe that natural was better when I had to be on so many medicines throughout my life. I didn’t want to think I had been doing it wrong. I didn’t want to acknowledge that I had been exposing my kids to potentially harmful toxins. After all the stress died down, I viewed a class my friend taught on Facebook about natural options for supporting health and home. She mentioned cleaning products, essential oils, and supplements made by a company that did not compromise quality for quantity. That is what I needed in my life. 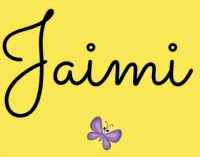 I needed a company that was going to be transparent with what they were putting in their products. 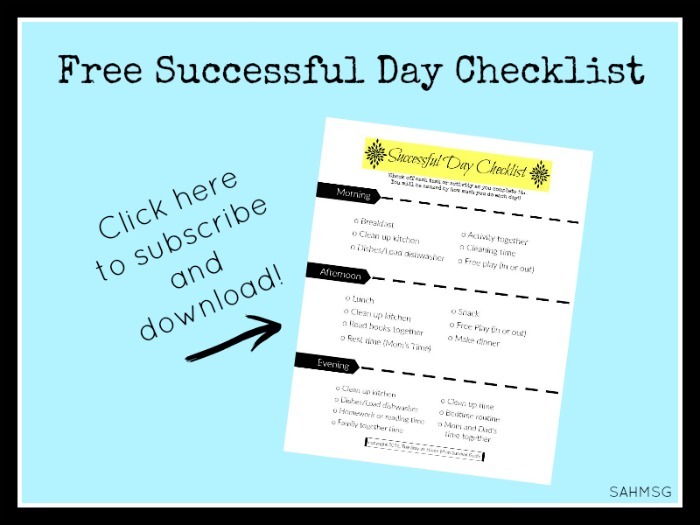 It was the freedom I needed to take charge of my home and health. It was time for us to evaluate what we were using on our bodies, in our bodies, and to clean our house. No doubt we all need to be staying well and living as clean of a life as we can, but I am not perfect. I still occasionally choose convenient fast food or buy packaged crackers because life as a mom is not easy. I did however find that in many ways it was easy to choose natural over toxin-filled. It was convenient and saved us money. Yes…convenient AND saved me money! After becoming a member of Young Living, to be able to buy my essential oils at 24% savings, I realized how much the Young Living lifestyle matched exactly what I needed in my life. Young Living is different than other essential oil companies. They own their own farms and control the quality of every oil from the seed to the seal on the bottle. They have a website specifically for their purity guarantee SeedtoSeal.com. I even visited the Young Living Farm in Utah June 2017. No other essential oils company has the transparent process and quality control that Young Living offers. 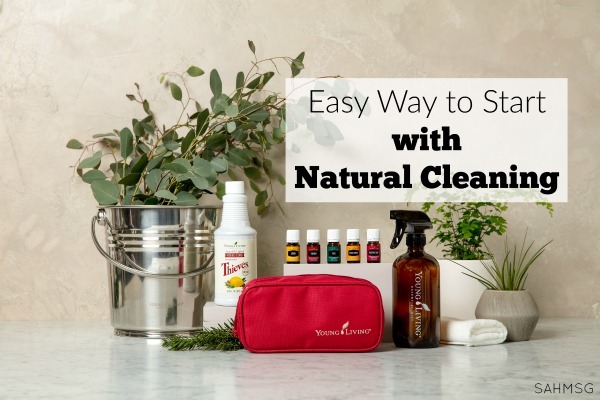 I love all the options I have with Young Living for supporting my health, supporting my energy as a busy mom, and having access to natural cleaning products for my home. It’s health freedom! We are not stuck with what is in the stores. We have access to so much more. 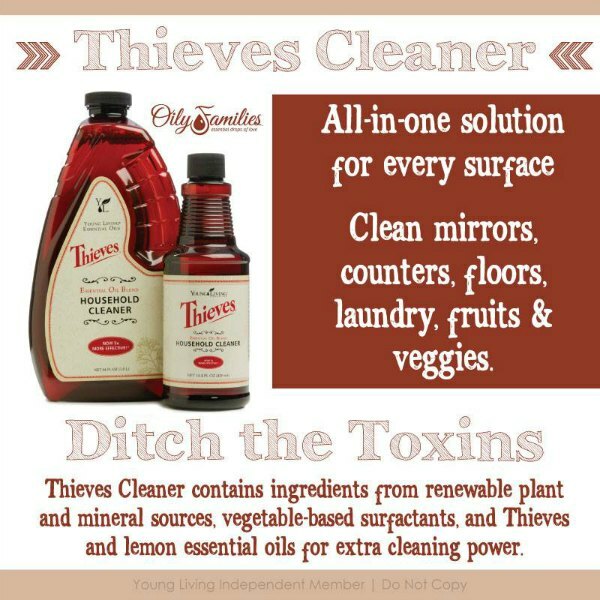 I started using Thieves cleaner as an all-in-one cleaning solution. It is plant-based and completely natural. Because it comes in a super concentrated solution, I can make 1 bottle last 6 months. It only takes one capful of the Thieves cleaner to make 24 oz of cleaning solution. That costs me $1 per 24 oz spray bottle! It’s amazing how we think natural is expensive, but it is not when we do our research. Thieves cleaner cleaned so well, smelled great and was really effective. I used it mixed with baking soda as a soft scrub, I poured a bit of the concentrate on laundry as a pre-treater, and I pour two capfuls in my steam vac to clean the carpets. Thieves essential oil is a blend that is proven to support the immune system, so I was eager to use it in our home in as many ways as possible. That made me want to try all the Thieves products! The home care line has Thieves EO as its base ingredient. How can you get Natural Cleaning Products at the Best Price? The Thieves Starter kit is the way to get started with using kid-safe cleaning products in your home. You get the concentrated Thieves All Purpose Cleaner, Thieves hand soap, Thieves essential oil blend, and additional essential oil samples that you can try. I recommend wholesale membership with Young Living, because you can’t beat Seed to Seal and it saves you 24% off every purchase. There is no monthly minimum order, you don’t have to sell a thing, and you never have to pay your membership fee again as long as your account stays active with at least one $50 purchase every year. I am a budget-minded gal. It’s important to me to stick within our financial limits. Where else can you get a high quality cleaner for $1 per spray bottle? This is a change we all need to make to keep our families well and support our wellness over the long term. There is no way to avoid the unknown, but when my doctor told me that an approved medicine could cause my health to deteriorate over time, I felt it was smart and wise to make some changes for myself and my family. We can use natural products first to avoid harmful side effects. That is a value money can not buy. Investing in my family’s health in this way is not optional for me. It’s necessary. Our kids learn from us. Choosing kid-safe cleaning products, natural wellness options, and Young Living was a life-changing choice. I feel better than I have in 25 years, my health is stable, and my kids get to learn a better way. 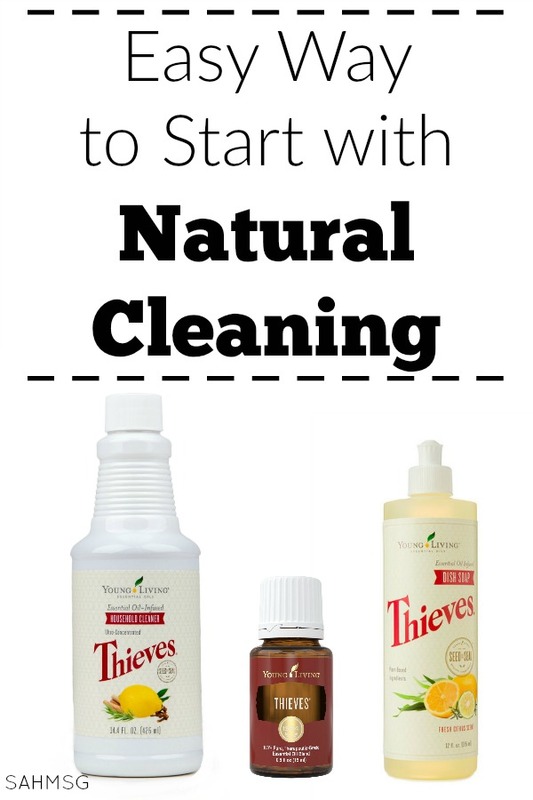 Have you tried Thieves Natural Cleaning Products yet? 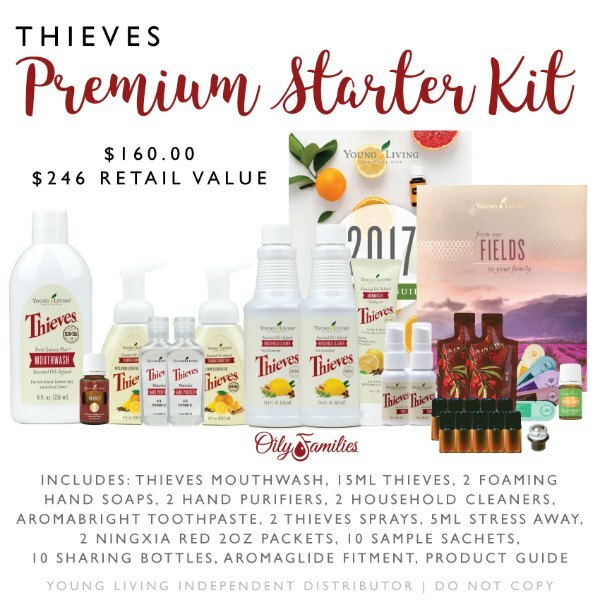 Read the details on the Thieves Starter kit to get plant-based natural cleaning products and home care products today. You won’t regret it and you’ll be giving your family a safe home environment. Read all the benefits and FAQs on Young Living wholesale membership options here. 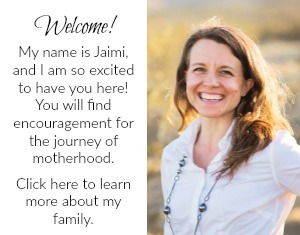 Already a Young Living member? 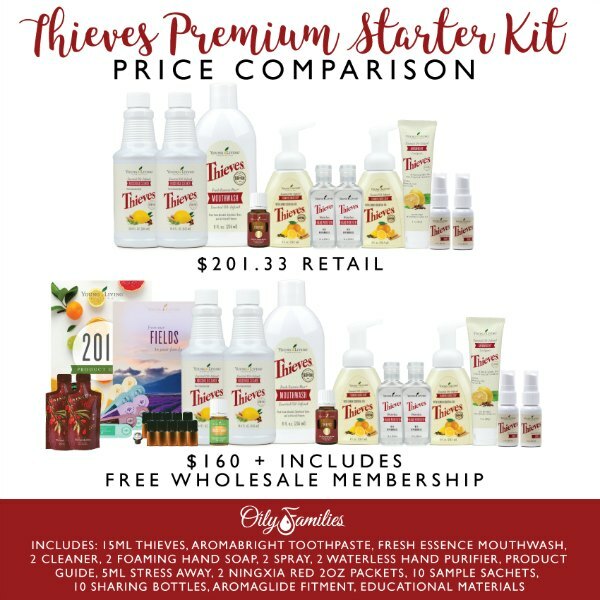 Talk with your Young Living sponsor about the cost-savings on the Thieves Essential Rewards kit. It saves you money even off of wholesale price! Looks like these are great products for cleaning stuff. Such a great tip! Thanks so much for sharing! They are so great! Knowing they are all-natural and effective makes me very happy.